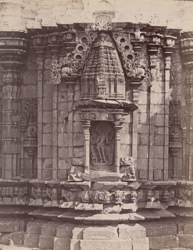 Photograph of a sculpture in a niche on the wall of the Mallikarjuna Temple at Kuruvatti, taken by Henry Cousens in the 1880s. Kuruvatti is situated in the modern state of Karnataka. The Mallikarjuna Temple is a Late Chalukya temple from the late 10th Century. It consists of a sanctuary and a mandapa or hall with three porches and faces east. The sanctuary is roofed by a multi-storey square tower and has preserved the original kalasa, the pot finial. The outer walls have long wall panels decorated with miniature temple towers surrounded by makara, aquatic monsters, very elaboartely carved. The icons inside the three niches of the sanctuary are damaged. This view shows the southern niche, now completely broken, but still almost complete when Cousens took this photo. It probably represents Bhairava, a wrathful incarnation of Shiva.